Over on the Sepia Saturday Blog, the theme this week is 'Workers'. Here are three postcards from my collection that show workers posing for photographs, all are from the UK and date approximately from the time of the first World War. None of these postcards are identified as to location, subjects or dates. 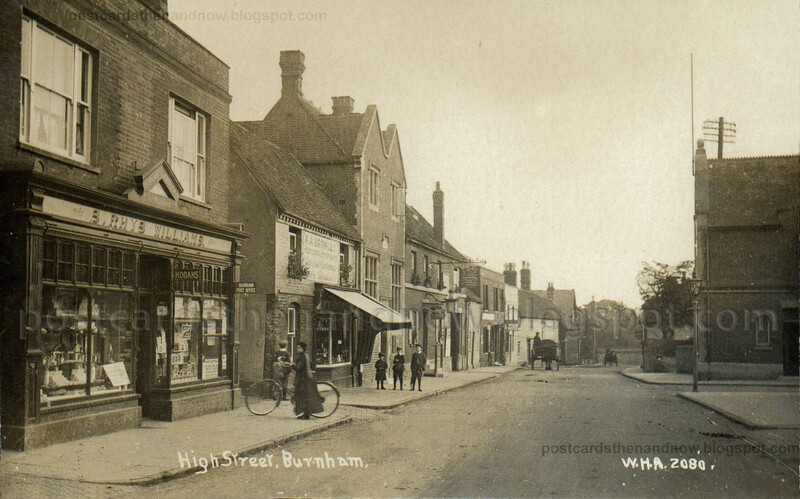 Postcards like this can be picked up for next to nothing on eBay or at postcard fairs. If the factory or identity of one or more of the sitters can be established, values can go very high indeed. 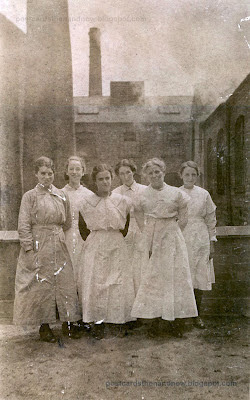 The first postcard, my favourite of the three, shows a group of female workers in an industrial setting. Their uniforms are very clean which makes me think that they may be laundry workers, but that is pure conjecture on my part. I love the beaming smile on the girl second left. 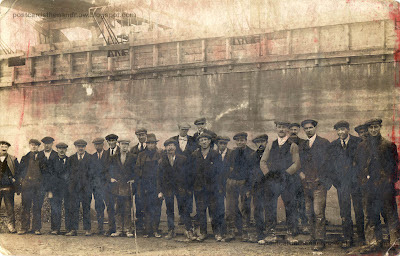 The second postcard shows a group of male workers, possibly at a ship yard. The man in the middle with the spectacles and the check scarf is particualrly notable. The final postcard shows a group of workers from a factory somewhere near Ealing in Middlesex. They are probably engaged in some kind of work for war production. That looks like railway tracks in front of them. Unfortunately the back is blank (as are all three postcards in this post) except for the word 'Ealing' pencilled on the back. The identity of the girl that has been cirlcled is unknown. As always, click the postcards to enlarge. The first two postcards are at 300 dpi so you may want to save them to your computer to view them in detail. 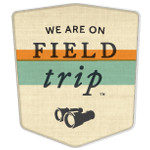 No 'now' pictures from Google Street View this week. Chelmsford, Essex, The Market House Pub [interior] circa 1908. 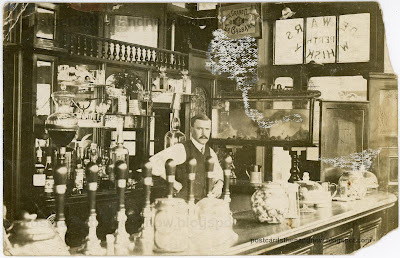 This unprepossessing and badly damaged postcard may seem quite ordinary, but in my years of collecting postcards of pubs this is one of the handful that I have seen that show a real photo of a pub interior. Not a stylised advertising postcard pub interior, or one of the very common hotel bar interiors, this is a real rarity and shows an honest old-fashioned pub from over a hundred years ago. 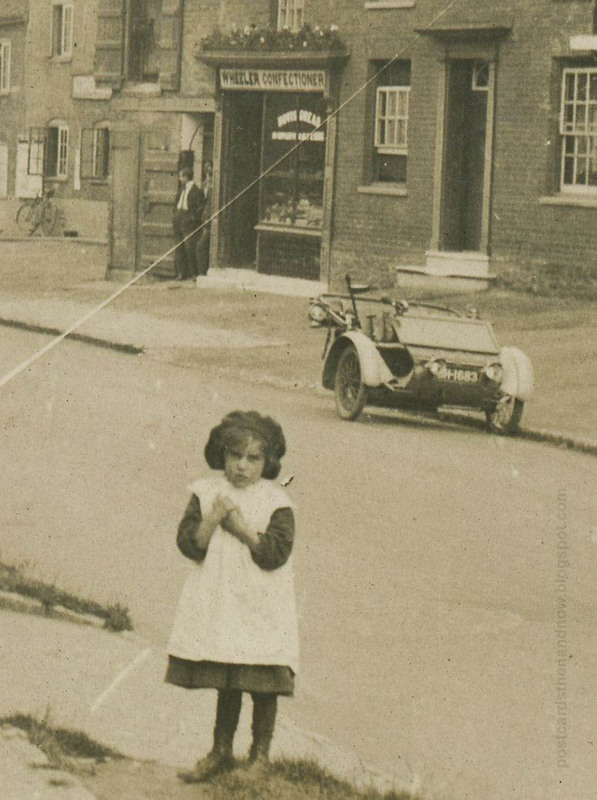 The Market House was at 1 Tindall Street, Chelmsford. 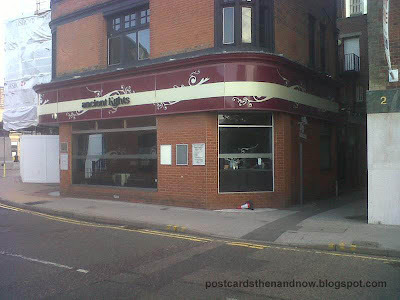 Long since closed, this location is now home to a cocktail bar called 'Ancient Lights'. On a recent business trip to Chelmsford I snapped an early morning picture of Ancient Lights on my phone. I have no idea what it is like in the evening, but I suspect is is very different to the Market House pub of a hundred years ago. Alas, we don't know precisely who the barman is. The pub at this time, 1908, was run by Thomas William Judge who had the pub from about 1898. The sender of the postcard identifies the barman as 'one of the sons' so it is likely to be Thomas W Judge (Jr), born 1877 or John A Judge, born 1879. 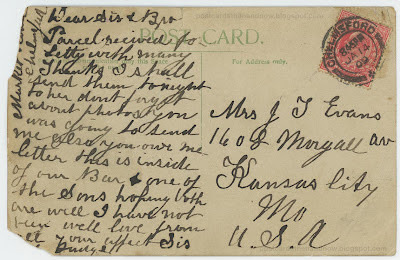 The postcard was sent to a Mrs Evans in Kansas City, USA, in January 1909. The strange white thing in the middle of the postcard is damage. Notice the fishtank and above that a model of a ship. I can't work out what are in the jars on the bar - snacks of some kind no doubt. There are eight handpumps on the bar, a good selection. 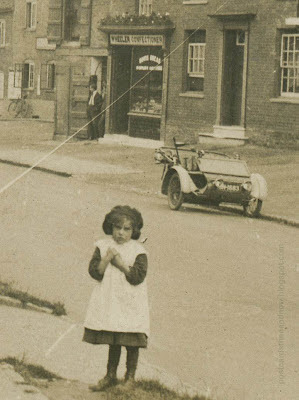 For more old photos why not visit the Sepia Saturday blog. 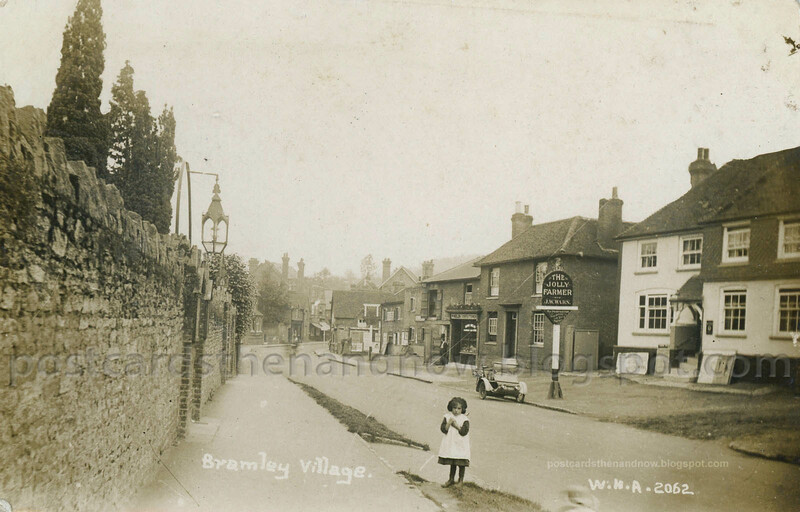 Bramley Village, Surrey, circa 1913. Bramley is a village a few miles south of Guildford. In this postcard we can see the A. C. Sociable car belonging to the photographer that I featured last week in this post. The Jolly Farmer is still in business. The diagonal line you can see on the postcard is a scratch on the negative. 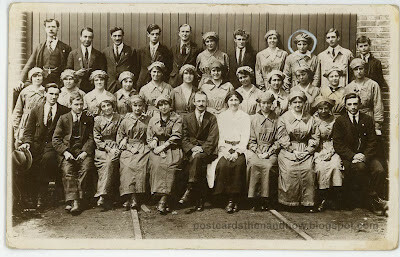 The young girl in the centre of the picture makes this ordinary postcard quite charming. Postcard by W. H. Applebee. Click the picture to enlarge. 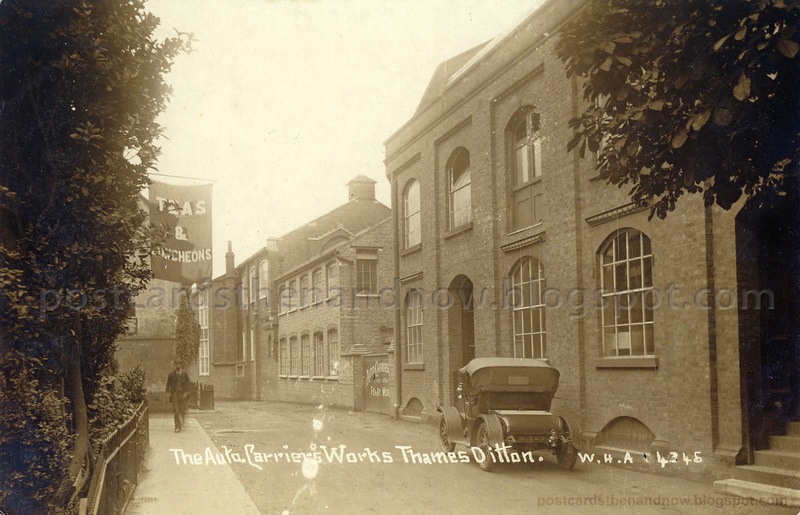 Thames Ditton, Surrey, Auto Carriers (AC) Works, circa 1912. AC Cars began in West Norwood in the dawn of the twentieth century, founded by the Weller brothers. 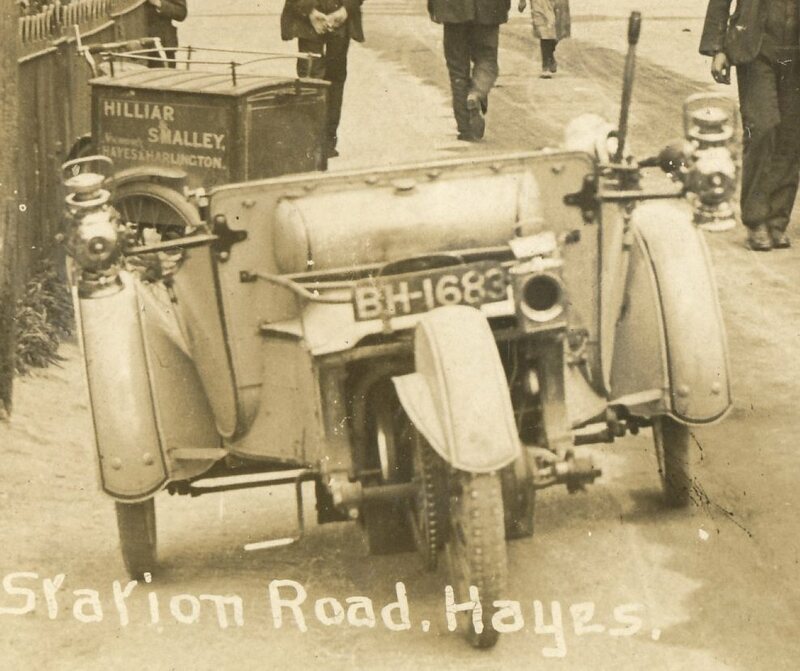 Among their earliest designs was a neat three-wheeled car with one wheel behind the driver and two in front. 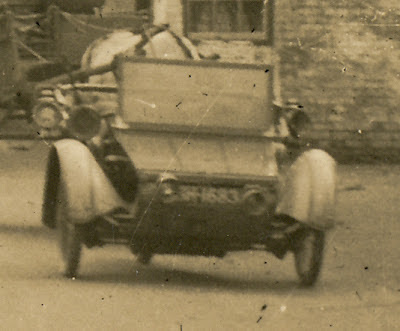 On the front wheels a large parcel area was placed, thus making the car ideal as a delivery vehicle. This was called the 'Auto Carrier' and thus the AC marque was founded. In 1907 a passenger version appeared, where the driver and his passenger sat above the front wheels. Steering was by a tiller. This passenger version was known as the 'AC Sociable'. By 1911 the company had moved to Thames Ditton in Surrey. 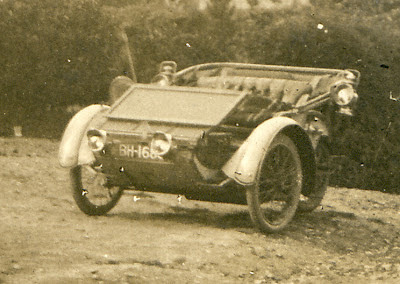 An early AC Sociable, registration number BH-1683, appears in many of the postcards of postcard publisher and photographer William Henry Applebee. Have a look at this post and this post for a look at his AC Sociable. Underneath the Google Street View you can see close-ups of Mr Applebee's AC Sociable. The postcard you can see here shows the Thames Ditton works shortly after they were founded. I am tempted to think that Mr Applebee came here to have his AC Sociable serviced and took a few photographs while this was being done. I assume the car you can see is an AC - they also made four-wheelers. Much later they became very famous for their sports cars including the mighty AC Cobra, all produced at the Thames Ditton Works. The building you can see on the Google Street View is clearly the same building as the one on the postcard, but it is much-altered. AC Cars are still in business but are not produced in Thames Ditton anymore. 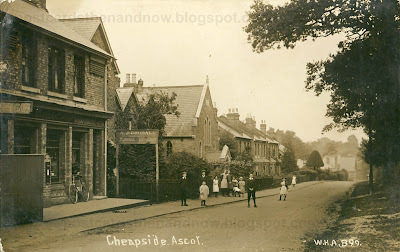 Postcard by W H Applebee of Ashford. Click the postcard to enlarge. If you right-click the enlarged version you can save a 300dpi copy to your computer. 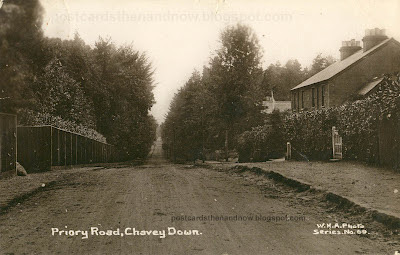 For more old photos you may care to visit the Sepia Saturday blog.